← One Song for the rest of your life? on a Deserted Island! If you are someone in Recovery from any kind of addiction or you are in a position that allows you to help people in recovery from addiction then this movie is MUST SEE! Based on Catherine Ryan Hyde ‘s book with the same title this movie is a powerful drama with a great message and wonderful acting . 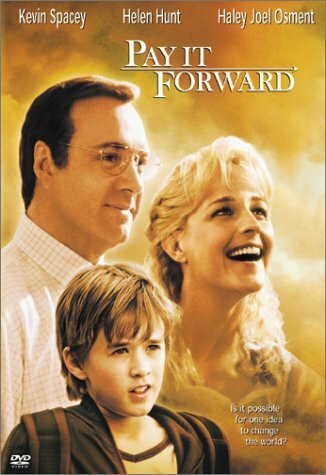 It was released in 2000 and stars Helen Hunt (looks great in this movie), Kevin Spacey, and Haley Joel Osment as Trevor. Posted on April 18, 2014, in Movies, Movies you Should See and tagged abusive husband, addiction, alcoholism, Catherine Ryan Hyde, directed by female, drama, drug addiction, exotic dancer, extra credit assignment, good movie, haley joel osment, helen hunt, jon bon jovi, kenin spacey, kindness, mother son relationship, movies you should see, pay it forward, recovery, recovery movie, single mom, single mother, sobriety, social studies, taecher student relationship. Bookmark the permalink. Comments Off on Movies You Should See – Pay It Forward.